With an ever-increasing number of multi-generational family members under one roof, accessible kitchen design focuses on residential kitchens that need to be adaptable to the needs of many, including older people who may have individualized food preferences and those with specific dietary requirements. The space will require freedom of movement without extended travel distances, tight passageways, or physical barriers. It will require designs that offer ease of use and access to functional storage, requiring accommodations in cabinet design, floor space, counter heights, and more. The space should continue to encourage conversation and connectivity while family members and friends are gathered around the kitchen table. Keep the footprint of the kitchen work triangle small, with the sum of the three sides no greater than 26 ft., and each side no less than 4 ft. Vary counter heights to allow cooks to stand and sit when necessary, by providing at least one knee space under the counters, space for a stool to be stored when not in use, or both. Lower the bottom box of upper cabinets to 15 in. above the counter, and specify full‐extension drawer glides and pullout drawers for all lower‐cabinet storage. Use pull hardware rather than knobs for easier grasping. Choose contrasting colors for flooring, cabinets, counters, and so on, which will greatly help the visually impaired cook. To accommodate a wheelchair in your kitchen cabinet design, it’s important to make sure that your kitchen has adequate floor space for the chair to move and turn. A distance of 48 to 60 in. between countertops is recommended. To increase kitchen accessibility, include multiple counter heights or pull-out bread boards for more flexible work spaces. Accessible kitchen design requires base cabinets with a higher, deeper toe kick. Also consider leaving a knee space under the microwave oven, with a maximum height of 30 to 32 in. If that is not an option, it is important to at least avoid placing the microwave over a cooktop, due to the danger of lifting a hot dish from an upper height and over a possibly hot cooktop. Positioning a microwave at a lower height and near a landing pad permits the safe transfer of hot containers. Many types of microwave drawers are available, as well as a microwave with a reversible door. 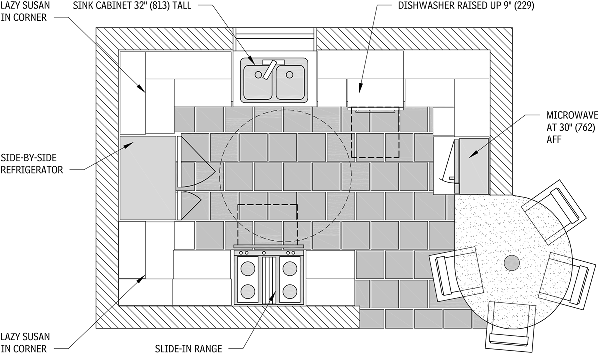 Another way to make a kitchen space more efficient and usable is to raise the dishwasher 6 to 18 in. above the floor, which gives everyone easier access. Beyond the underlying structure of the kitchen itself, many modern appliances can make a kitchen work triangle more accessible for multigenerational family members. For both younger and older members of the household who might have trouble opening the main refrigerator, a smaller refrigerator, can be a significant upgrade. Also consider refrigerator drawers for breakfast items and snacks. For family members who will be cooking, a smooth electric cooking surface is easy to clean and avoids the flame of gas‐supplied heat. Induction cooktops are especially useful: they have the added safety measure of not heating up their surface, instead transferring the energy directly to the cooking utensil. Should gas be the preferred fuel choice, many units are designed with sealed burners, recessed below the surface of the range, which help protect the user from a tall open flame. Regardless of whether a kitchen features an electric cooking surface, an induction cooktop, or a sealed-burner gas stove, controls in the front (vs. on top) allow for greater safety. Types of control knobs and buttons should be based on users’ ability level. Also, a portable induction cooktop might be a versatile addition for a seated cook, as it can be used outdoors, too. In terms of ovens, a side‐open oven is a positive addition as it eliminates the need to lift hot items over a hot oven door to remove them. Ideally, a heat‐resistant surface should be installed below and next to the oven to facilitate lifting out the hot food and sliding it over, and then closing the oven door. Aginginplace.com has a list of other important kitchen items for aging in place, including a lazy Susan in a deep corner cabinet, full-sized oven mitts, large-handled utensils, and even an under-counter jar opener. These and other suggestions and diagrams are now available with AGS Online. For more than 85 years, Architectural Graphic Standards (AGS) has sought to provide architects with the most current design practices and standards. With the power of electronic online publishing, AGS Online is able to continuously update technical and design knowledge in an industry that can’t wait on traditional book publishing. “Aging in Place—Accessible Kitchen Design” is one of many AGS Online series that addresses the needs of an aging population and reflects the current standard of care in building design. It includes a step-by-step design process, and figures that show current best practice in addressing the needs of the modern family.